Remember in the 1980s when gold rallied by 800%. Well before it did, the gold price halved. We have seen the same thing happen in silver of late. 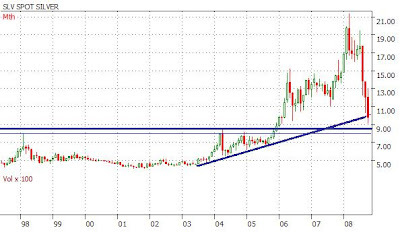 Silver has fallen back to important support levels, so its set to rally. All that money the Fed has created to re-capitalise the banks is going to prove inflationary in time. The implication then is that we want to hold asset classes which are not over-priced, like gold, silver, rural property, etc. Silver is currently trading at $9.75/oz, up 33c overnight after halving in last 6 months. This is the time when you should be accumulating silver. You might ask me whether you should be trading Contracts for Difference (CFDs) in these commodities. I see no reason why you shouldn't because if these companies are exposed, your exposure is limited to the money on the table, and that's only 10% of your exposure if you are moderately geared to silver. You can actually gear silver as much as 20x as far as I'm aware, though it will depend on your CFD platform. Platinum prices reach a low?